The meter resembles a cellular phone or a remote control and therefore does not stand out like an ordinary blood glucose meter.Accu-Chek Softclix lancets make blood sample collection more comfortable through precise linear action, making it easier to test as often as necessary. Accu-Chek Multiclix lancets additionally offer a lancet drum with six spare lancets to eliminate the need for lancet handling . Kit includes meter, carrying case and instructions. 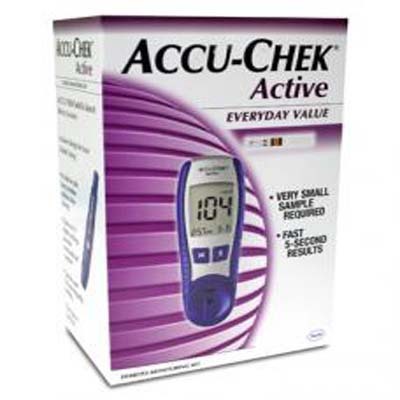 (Accu-Chek Active Blood Glucose Meter Kit).